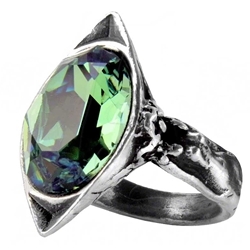 The Absinthe Fairy Spirit Crystal Ring features an emerald pond of illusion and creation. The shimmering crystal element of the ring is set among several sculpted fairies along the sides for a fantasy look. Absinthe was always called the green fairy by the doyennes of La Belle Epoque, or Good Times. Artists, writers, poets, and philosophers congregated in Paris during 1880-1918. This Gothic ring is hand cast from fine English pewter.